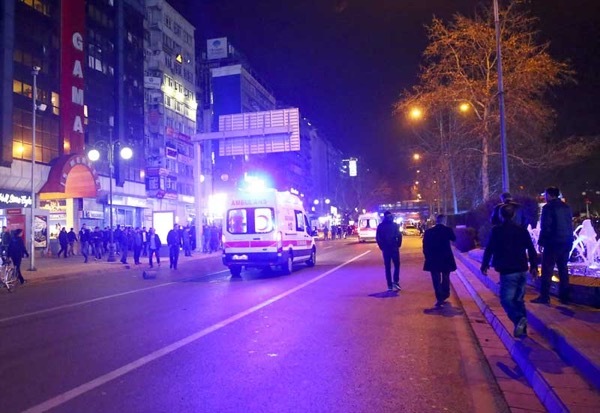 At least 27 people were killed and 75 others were wounded after a car exploded in Ankara’s central Kizilay neighborhood at 6.45 p.m. local time (1645 GMT) Sunday evening, Ankara Governor’s Office said in a statement. According to the statement, 23 people died on the spot, while four others died on way to the hospital. A total of 75 wounded persons were transferred to hospitals across the city, the statement added. The blast apparently targeted the area’s transportation hub of bus and minibus stops, and the central metro station. Some vehicles have also been reportedly damaged in the incident. After the blast, several fire-fighting trucks and ambulances were seen rushing towards the scene. Pedestrians and vehicles were also not allowed into Kizalay Square, while a police helicopter also hovered above. Security forces evacuated the area in case there is a second blast. Ankara Governor Mehmet Kiliclar also arrived at the scene to survey the area. Turkish President Recep Tayyip Erdogan spoke with Interior Minister Efkan Ala over the phone, who briefed him on the incident. According to Prime Ministry sources, Turkish Prime Minister Ahmet Davutoglu will chair a security meeting later in the evening to discuss and assess the situation after the blast. Turkish Ministry of Health also announced there is no need for blood donations in Ankara hospitals at the moment.